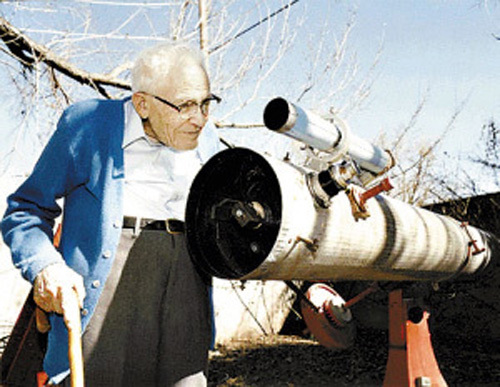 On Feb. 18, 1930, Clyde Tombaugh, a young astronomer at the Lowell Observatory in Flagstaff, Arizona, discovered the planet Pluto while blinking images of the sky taken on Jan. 23 and 29 of that year, in an attempt to find anything that moved against the field of background stars. 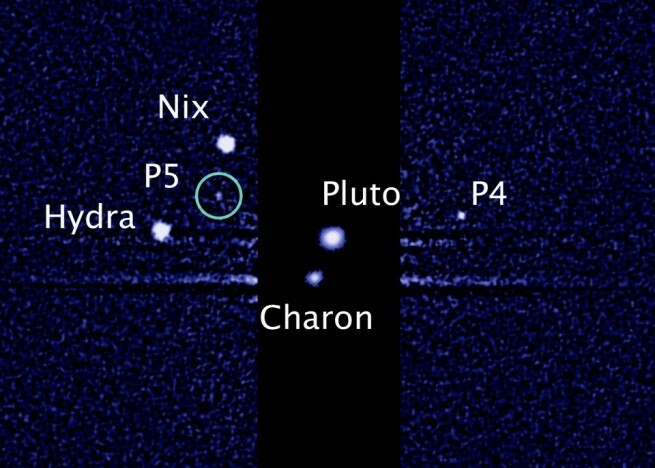 Eighty-five years later, NASA’s New Horizons mission released its first ever images of Pluto’s tiny moons Nix and Hydra taken by the spacecraft’s LOng Range Reconnaissance Imager (LORRI) to commemorate the anniversary of Tombaugh’s discovery. The long-range images were taken between Jan. 27 and Feb. 8 of this year from distances ranging between 125 million and 115 million miles (201 million to 186 million km) from the Pluto system, as part of the optical navigation process aimed at refining the spacecraft’s trajectory through the Pluto system in July. When Pluto was discovered, astronomers’ telescopes could not resolve it into a disk because it is so small and distant. Some suspected it was the moon of a larger planet. Its largest moon Charon was not discovered until 48 years later, when astronomer James Christy discovered a “bump” in images of Pluto that seemed to rotate around the planet. Image of Nix and Hydra orbiting Pluto. Image credit: NASA/Johns Hopkins University Applied Physics Laboratory/Southwest Research Institute. Nix and Hydra were discovered in 2005, just months before the mission’s launch, by members of the New Horizons team using the Hubble Space Telescope. Both have diameters ranging between 25 and 95 miles (40 to 150 km). New Horizons will determine their true sizes during the July flyby. Hydra orbits Pluto every 38 days from a distance of 40,200 miles (64,700 km) and is the planet’s outermost known satellite. 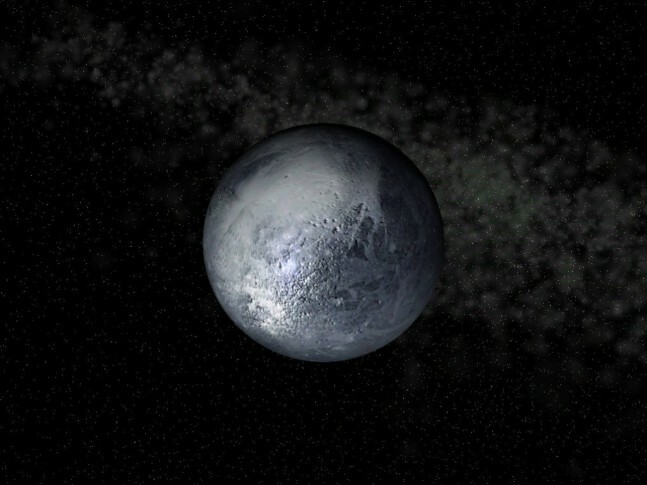 Nix orbits Pluto every 25 days from a distance of 30,260 miles (48,700 km). The LORRI images of Nix and Hydra were combined to create a seven-frame animation showing the moons’ movement as they orbit Pluto. Nix is highlighted by an orange diamond and Hydra by a yellow one to help viewers locate the tiny objects. Each frame is comprised of five ten-second images captured in a special mode LORRI uses that combines pixels to allow for greater sensitivity. Finding Nix and Hydra in the original LORRI images is extremely difficult because these photographs were taken against the glare of numerous background stars as well as the glare of much larger Pluto and Charon. Pluto and Charon are over-exposed in these images, which is why bright and dark streaks appear to emerge from Pluto’s right side. These are effects of camera electronics and not actual features. To prevent these streaks from completely concealing Nix and Hydra, New Horizons and LORRI were rotated when the pictures were taken. As a result, the streaks seem to change direction from one image to another. LORRI’s images were processed to give viewers a better view of Nix and Hydra. The glares of Pluto and Charon and of the background stars were subtracted, or removed, to highlight the small moons. Moons Kerberos and Styx, discovered in 2011 and 2012 respectively, also by New Horizons scientists using the Hubble Space Telescope, are too faint and small to be visible from the spacecraft’s current location but will appear in images taken at closer ranges. Tombaugh was only 24 when he discovered Pluto after a yearlong search during which he photographed sections of the sky using a 13-inch astrograph, a telescope furnished with a camera. He took hour-long exposures, capturing them on 14-inch by 17-inch glass photographic plates. Using a blink comparator, Tombaugh studied images of the same part of the sky taken several days apart, blinking back and forth between the two to find anything that moved from one night to another. New Horizons Principal Investigator Alan Stern, also of the Southwest Research Institute, has tremendous admiration for Tombaugh. “Professor Tombaugh’s discovery of Pluto was far ahead of its time, heralding the discovery of the Kuiper Belt and a new class of planet. The New Horizons team salutes his historic accomplishment,” Stern said. Launched on Jan. 19, 2006, New Horizons is currently 32.29 Astronomical Units (one AU equals the distance from the Earth to the Sun, approximately 93 million miles or 150 million km) from Earth. Tombaugh’s widow, the late Patricia Tombaugh, then 93, was present for the launch. Mrs. Tombaugh had hoped to see this summer’s flyby but passed away in Jan.2012 at the age of 99. Tombaugh died three weeks before his 91st birthday, in Jan. 1997. A portion of Clyde Tombaugh’s ashes are on board New Horizons. A commemorative note inscribed on the container carrying them credits Tombaugh for discovering Pluto and the solar system’s third zone. Actually Tombaugh died in 1997. The article has edited to clarify. Sorry for any confusion. Great article. Very detailed. Stuff I did not know. I never imagined when I first learned about Pluto in kindergarten in 1966 that someday I would get to see it as clear as the other planets. I am so glad New Horizons is making a dream come true!